The Thursday night mountain bike rides are gaining momentum. Thanks to Downtown Joel Brown and Phil. Each week the crew has gotten mangier and mangier (I don't think that's a word). The rides have been meeting at 6:15 at the footbridge by the U. Casual pace on the flats, doing work on the climbs and descents. These photos are from last Sunday's 3 Summit Ride. I missed the "Death Ride," and instead hit Joel and Phil's first annual "3 Summit Ride." We ended up with just four of us at the top of University (DT JB, Pipo, Tob, and myself). I threw in a photo of Dale cause he was hurting from the weekend and I thought it was funny. When you've got the slight helmet tilt you know it was a rough night. If you want to mountain bike with a mangy crew join up Thursday's 6:15. 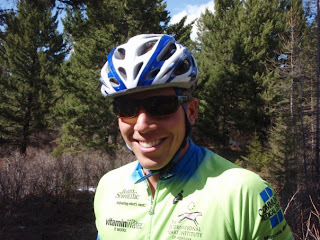 Kenda/Titus is the mountain bike team that Missoula boy Andy Schultz rides for. It's also the team of Zephanie Blasi. Zephanie is a pro female mountain biker who frequents the NMBS calendar. She recently moved to Missoula and was spotted on the Hell Ride last night. She's a consistent performer on the national scene. Missoula welcomes her to the scene. Since I can't be at all the races. My man Joe Chalmers has come through and provided us a sick report from this past weekends Coyote Classic. Joe will also be the official reporter for Belt Omnium. Thanks Joe! 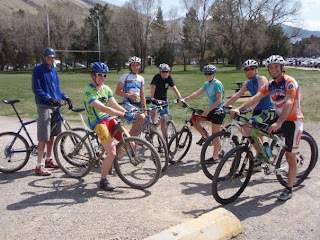 Boise, Idaho played host to Sundays Coyote Classic which is stop #8 on the National Mountain Bike Series calendar and Montana had four players in the men’s expert, woman’s expert and pro/semi-pro fields. 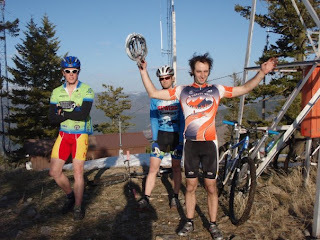 Bill Martin and Joe Chalmers (writing) were in the men’s expert, Lisa Curry lined up in woman’s expert and John Curry was the first of the Montanans off the line in the Pro/Semi-pro field. After riding a bit of the course the evening before we discovered that it had a bit of everything and would be a real challenging race. Lots of climbing, technical single track, creek crossings and the threat of punctures from thorny goat heads were all factors in this twenty-four mile cross country race. I had a great view of the start of this pain fest since my expert field was lined up just behind and would leave one minute after their gun went off. Cody Peterson was the man to watch. He is a local boy from just up the road in Sun Valley and he is also a top national pro who just recently finished third at the Sea Otter short track cross country. Bozeman’s John Curry was lined up on the front row of the 15 racer field and I have to say when that gun went off I was really surprised how fast Cody started. He was out of the saddle in an all out sprint as he went around the first sharp corner and he had everyone strung out and already fighting to grab his wheel in the first few hundred meters. One racer was able to bridge up to him as they entered the first single track climb but he couldn’t sustain the pace and soon blew up and Peterson was on his own for the rest of the race. John made his way up into the top five after the first single track climb dumped onto the dirt road that started the first short loop. He was in 4th place as his small chase group entered the technical single track descent and that’s when his front tire decided to explode. He got a new tube in place but for some reason it wouldn’t hold air and after a couple of attempt’s with a floor pump in the feed zone his day was over. The group that he was in when his tire blew held their positions and finished the race in the top five. There were approximately 35-40 experts at this race which is a good sized field. There was ample time to pass on this course before the first single track section so a fast start wasn’t critical as it might be on some other courses. I was able to get a good position on the line and was at the front as we headed up the first single track section. The course consisted of a one mile dirt road start and then onto a five minute single track climb that led to the main venue which consisted of two small loops and one large loop back to the finish. Bill Martin started behind me and on the second small loop he had his engine churning and passed me on one of the climbs looking very smooth. Coming through the feed zone heading towards the long loop the legs were aching a bit and I soon found out that this long loop was exactly that….LOOOONG. It was mostly on an old access road of some sort and it seemed to go on forever. Every time you went around a corner and thought you might see the descent start heading back down to the valley floor the road would just continue up another section of the mountain side. Finally the trail headed south into a ravine single track with multiple deep creek crossings and one last climb over a ridge that dumped back onto the road to the start/finish. Bill rode a great race to finish first overall out of forty experts and I finished third. The organizers put together a great course that put all of the skills to the test. I was bloody, muddy and tired which is just the way you want to finish a tough mountain bike race. Lisa had a strong start in her race and this was her kind of course but her internal GPS system played tricks on her and she ended up missing a turn on one of the short loop sections and had to back track a major part of the course in order to ride it properly. That made for a pretty long day in the saddle.